Have a transportation-related article you think should be included in headlines? Drop me an email! And don’t forget, Metro is on Twitter, Facebook and Instagram. Pick your social media poison! 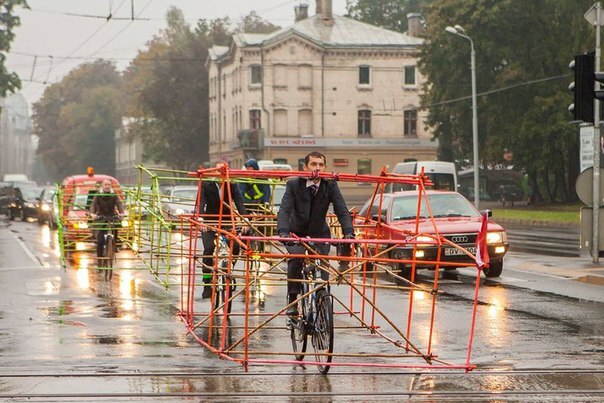 Art of Transit: Latvian bike activists show how much space a bike takes versus that of a car. Clever. Click above for more photos. Photo by Artūrs Pavlovs. The traffic data firm Inrix sampled traffic on the northbound 405 for a couple of weeks last month between the 10 and 101. The finding: it basically takes the same average amount of time to travel between the 10 and 101 in 2014 as it did in 2013 before the NB 405 HOV lane was fully opened. There are a couple of caveats: Inrix says that the number of cars crossing the pass has increased because of a regional surge in traffic (likely tied to the economy) and that travel times in the last hour of peak travel times is faster than it was before the HOV lane opened. The finding that speeds appear to have remained level despite the increase in traffic is a sign of the project’s success, Metro spokesman Dave Sotero said. Caltrans, Metro’s partner on the 405 Project, estimates that the carpool lane handles 1,600 cars per hour during peak travel times. “If you didn’t have that extra lane, all those cars would be competing for five lanes instead of six,” Sotero said. What’s more, the 405 Project’s benefits go beyond traffic speeds, Sotero said. The project enhanced safety by rebuilding three bridges to better withstand earthquakes and by creating additional shoulder space on the freeway, he said, while reconfigured on- and off-ramps have increased capacity and improved traffic flow. Sotero said the project never was expected to be a panacea for rush hour traffic. Two other points worth chewing on: the new Valley-Westside Express Bus will debut Dec. 15 and use the NB HOV lane on the 405 (click here for more info). Also, the Inrix sampling doesn’t consider how many people are in cars crossing the pass. HOV lanes typically carry more people than regular lanes (because those cars are mostly carpooling!) — i.e. meaning a lot more people are probably getting across the Sepulveda Pass in the same amount of time as previous. Canopies on the Westwood Station. 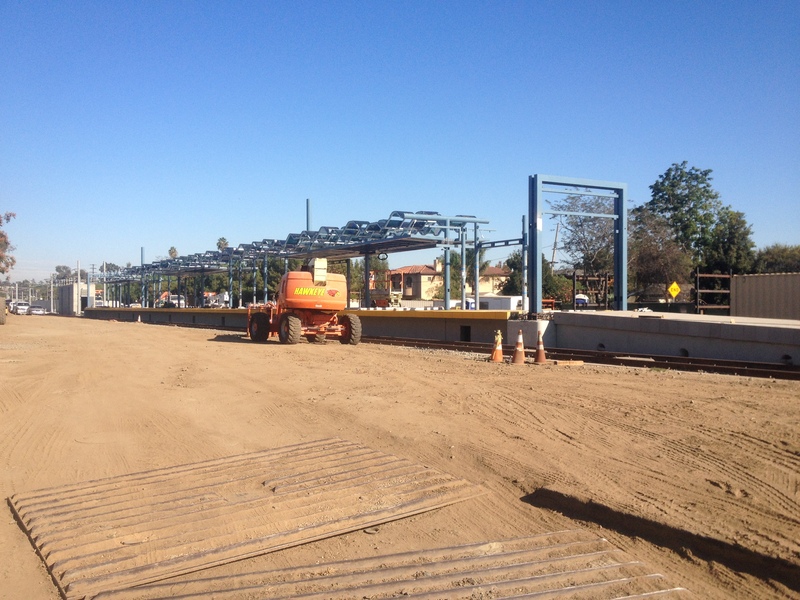 Photo courtesy Ron Miller, via Expo Line Fan’s construction gallery. Click above to visit the gallery. Expo Line Construction Authority officials say that all bridges are done and construction should be finished by next summer when the process of handing the project over to Metro could begin. That’s not a short or trivial process btw. Metro must inspect the line to make sure that the Authority, an independent agency set up by the state, was built to the agency’s specifications. Joe Linton attends a half-day gathering to mull the possibility of taxing motorists by the mile instead of the current scheme which involves a tax applied per gallon; California will soon launch a pilot program to test distance-based taxes. The post does a good job of capturing the nuances of the two taxation systems and concludes that distance-based taxes may work but there are a lot of variables involved. One interesting one: Americans overall are driving less, a trend that seems likely to continue. Although the fare evasion rate remains elusive, L.A. County Sheriff’s deputies issued 35.5 percent more citations (89,535) for fare evasion in 2013 than 2012, according to data from a public records request submitted by LA Weekly. The data also indicates — perhaps not surprisingly — that 19- to 29-year-olds are frequently cited, males are cited three times more often than females and the Red and Blue Lines are where most citations are issued (they are Metro’s two most heavily ridden lines, btw). The Weekly also made a video showing how turnstiles may be vulnerable to fare evasion although it should be noted: 1) Metro is hardly the only transit system with turnstiles and fare evaders; 2) If you get caught, you’ll be cited at least $75, and; 3) Metro’s bus and rail system is big and expensive to run and fares help pay for it. Not paying hurts our transit system and fellow riders. Los Angeles Mayor and Metro Board Chair Eric Garcetti says interest in L.A. by the NFL remains high. It appears three franchises — the Oakland Raiders, St. Louis Rams and San Diego Chargers — are the three most viable candidates and there are two potential locations, a new stadium next to Staples Center or a new stadium near Hollywood Park. From a transit perspective, it’s hard to beat the Staples Center location while Hollywood Park would require a shuttle from the Crenshaw/LAX Line when it’s completed, currently forecast for 2019. From an aesthetic/competitive point of view, the Raiders are hopeless and belong in Oakland while the Chargers could go deep in the playoffs this season but belong in San Diego. The Rams, however, should have never left L.A., play in an extremely ugly dome in St. Louis and being in L.A. would be a better locale to play their division rivals, the Seahawks, 49ers and Cardinals. So if the deed must be done, Go Rams! Are there any statistics on how many of the citations are actually paid? It will be the Rams with a new stadium in Inglewood. I would prefer the stadium in Downtown LA. Hopefully, AEG could make an great offer to the Rams owner to forgo his property in Inglewood for downtown LA. It’ll be nothing. The NFL needs the threat of “moving to L.A.” to force these podunk hamlets into building tax-payer financed stadia. I ride Metro rail regularly and I actually work on Metro projects and I just have to say that I get so frustrated with the way the Sheriff deputies check fares. The other day at 7th Metro station, the sheriff deputies created a bottleneck at the second level above the Expo/Blue line platforms as one deputy checked fares and two others stood by (presumably for extra safety). What bothered me the most was this checkpoint was maybe 50 yards away from the turnstiles. I JUST tapped my card and then I had to WAIT IN LINE and then prove I just paid. Why were they creating this bottleneck at this location during rush hour, when they could have stood closer to the turnstiles and had one deputy at the turnstiles watching people tap and two deputies near the staircase/escalator checking payment for those who were transferring. There really needs to be better systems in place in how the deputies check fares. I don’t mind when they come on board and check, or even when they walk along the platforms and check. But creating a bottleneck so close to where people were tapping was just ridiculous. Speaking of the NFL feasible return to L.A. Well, this has been discussed for a few weeks now and for the ones who have been following it, have been optimistic about the current status that it may be the final season in St. Louis and an insider from the Lou said that the Rams organization were talking about a done deal about relocating and will make the announcement on February 15, which you know everyone from L.A. is going to have that exciting crazy look on their faces, while the St. Louisians are sure gonna go amok if they lose another NFL franchise, since the Cardinals (football team) left the city for Arizona in 1987. Hope they never get one, since they hardly support their beloved team, only drawing less than 60K fans and sometimes 55K fans, thus the ticket prices for the home game reduces to the single digits. STL is a baseball city, congrats to the Cardinals beating us again, I thought the Dodgers had them again I guess not, but so much for adding another Dodger Shuttle express to the Harbor Transit Center. Since Rams owner Stan Kroenke bought a 60 acre land at the now defunct Hollywood Park in Inglewood, with hopes to build an NFL venue, well it’s gonna be far from the future Crenshaw/LAX light rail line and would require one or two shuttle connections from the Florence/La Brea and Aviation/Century stations to the possible future home of the Rams, since the majority take public transportation. Bus lines nearby would help that much, since there’s going to be a high volume of crowd trying to fill every seat on the bus and will require additional buses to handle the heavy crowd. It’ll lot be better if the proposed Farmers Field venue be built in DTLA, where light and heavy rails can help football fans get to the Sunday Football games quicker and walk a few blocks nearby, rather than taking several minutes to get from point A to point B in Inglewood. The Census Bureau last month released their household American Community Survey results for 2013. According to the Census estimated increase in the workforce ,and the survey results, there was about 34,000 more people in the city of Los Angeles commuting by car, truck and van compared to 2012. The city of Los Angeles has about 181 miles of freeways. About half of the vehicle traffic is carried on these freeways. So that would translate to roughly 950 more people traveling to work on that 10-mile section of the 405 freeway in 2013 compared to 2012. According to the Federal Highway Administration, of the 36 largest metro areas, Los Angeles ranks dead last in freeway lane miles per resident. The Los Angeles region also has the highest population density in the country. Residents of Los Angeles metropolitan area drive less than the average metropolitan area in the U.S. Part of the reason for that is that the major job centers are spread throughout the region rather than centrally located in a downtown area. Those LA residents who live west of Beverly Hills reported in the 2012 Census Bureau household survey results some of the lowest commute times by car, truck and van of the entire city. Lower commute times than the vast majority of the residents of the San Fernando Valley–which generally has much less traffic congestion than the westside of LA. The obvious reason for this is that the distance for commuting to work that people who live on the westside have is generally much less than those that live in the San Fernando Valley. Has Metro ever studied how FAR the fare evaders are trying to go? Perhaps they’re just trying to go a relatively short distance and they don’t particularly see that the $1.75 pricing justifies a short trip? If a shorter trip was around $0.50 would they pay it? Let’s not jump the gun on taxing car drivers by the mile without asking the question how it’s technologically capable as well as the issues and questions that arises. There’s a difference between doing distance based fares on local transit systems versus taxing by the mile for cars. The former can be done simply with issued TAP cards, tapping-in and tapping-out, compounded by the fact that local transit systems do not go beyond their areas. Cars on the other hand, brings additional questions. Cars don’t stay in the same area. They are free to go beyond our county lines, state lines, and even national borders. That brings new questions: how will it be done? Is it going to be strictly by recording the odometer reading each year to the DMV? What if some of those miles were used out of state like Arizona, Nevada, or Oregon, which many Californians drive to? How about driving down to a weekend getaway to Mexico? Not everyone stays within California. For example, if I drive to Vegas, and some of those miles are driven on Nevada roads, do I still pay the mileage tax to California for driving in Nevada? And there are non-Californian car drivers on our roads and freeways too. If a car driver from Arizona comes to visit California, how does one collect the mileage tax driven on California roads from cars registered in Arizona? Throw in Mexico both ways and now you involve a foreign country. That becomes a US State Department issue because individual states themselves cannot negotiate with a foreign country. That power rests in the federal government. And there are Baja California plates on our roads as well as Californians driving down to Baja California for a weekend getaway. So recording odometers aren’t going to work. The other option is to use GPS devices so miles not driven on California roads won’t be logged and won’t be taxed. Then again, that still leaves non-Californian drivers on our roads untaxed for using our roads and leaves Californians taxing ourselves to subsidize our roads for out-of-state and even out-of-country visitors who don’t have to pay anything. What a tremendous waste of taxpayer money. If Kroenke builds an NFL stadium in Inglewood, does that change the equation for LAWA’s airport connector? It seems like they could extend east from 98th street up to the stadium/Forum and get plenty of extra riders. At this point, the route for the Crenshaw/LAX Line is set and won’t be changing. Any future additions or extensions would be a separate project, assuming they could find funding. Bullhockey. I’m as white as a ghost, and I don’t seem to get a free ride from the sheriffs. There are real disparities in transportation, no need to make stuff up.